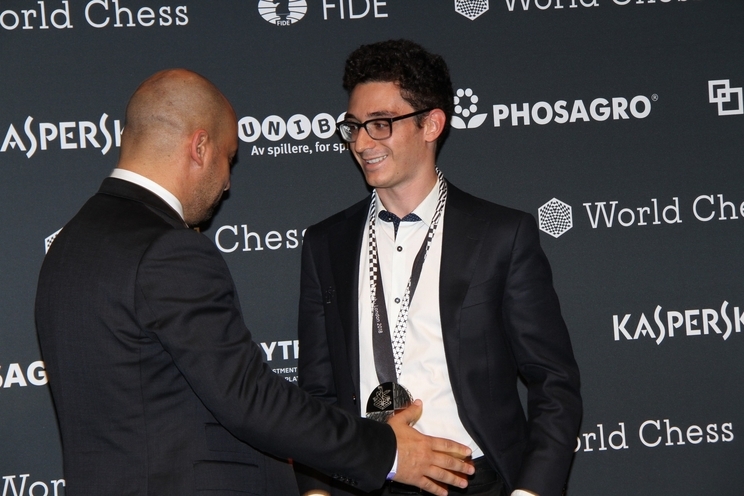 It seems no price was too high to find out if US hope Fabiano Caruana could end Magnus Carlsen’s five year reign as World Champion. At least on this day there was no danger of the players going home before a real fight had begun. Media of all sorts were out in force, with a second press room being set up to try to accommodate the extras. Twice as many photographers as could fit into the players’ glass box arrived for the World Championship denouement. Some who had been present at the match from day one found themselves excluded in favour of agency photographers at their first chess assignment. The newbies were disgruntled by the lengthy queuing for the game, press conference and presentation ceremony and the necessity to jostle for position over every shot. One described the event as the worst organised he had ever attended but the responses of the chess photographers were twofold: these battles for position are a piece of cake compared to the massive scrums at the 2013 title match in Chennai. 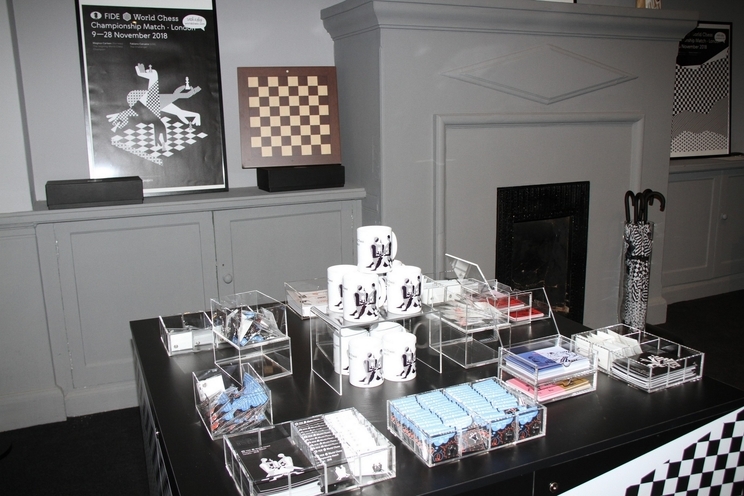 And besides, don’t you know that this is the best organised event that Agon/World Chess has ever held? 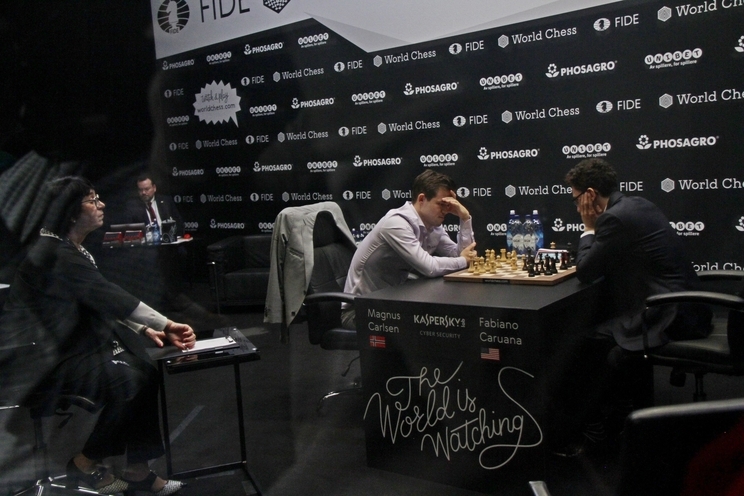 Behind Glass: Carlsen and Caruana with arbiters Stéphane Escafre and Nana Alexandria. After the 6-6 tie in the classical portion of the match, Carlsen was favourite to win the rapid tiebreakers, as he had done against Sergey Karjakin two years earlier in New York. In 2016 Carlsen was simply relieved to reach the tiebreakers at all, whereas in London the World Champion had clearly been happy to move to fast games since game 11. Carlsen’s faith in his rapid chess skills proved warranted as on Wednesday the crowd were treated to a one-sided massacre of Caruana by Carlsen. Caruana, under pressure for the entire game, missed a draw in a rook endgame in game one – a game which ended with a fist pump from Carlsen as he stood up after the game - and the rest of the match was one-way traffic. 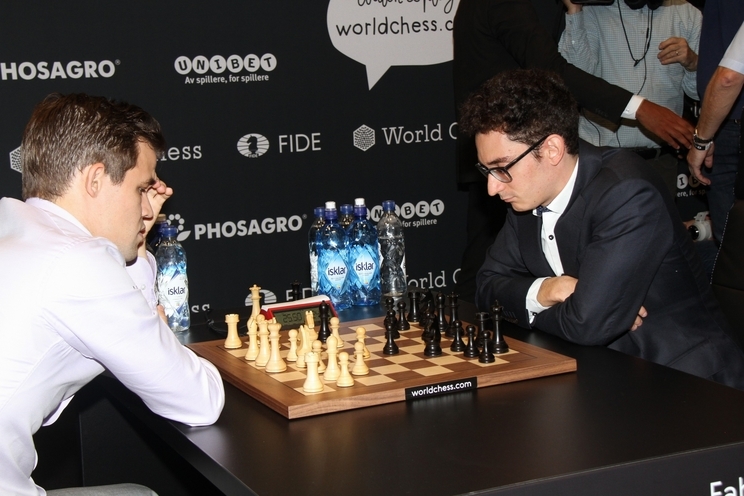 Caruana was crushed in the second game and unable to generate anything in a desperate effort in the third and, as it turned out, final rapid game. The applause from the crowd was hearty but far from overwhelming; many seemed stunned at how quickly Carlsen had put away his challenger. Carlsen was congratulated immediately after his victory by the Norwegian Prime Minister Erna Solberg, who has been in power for all four of Carlsen’s World Championship victories. Caruana looked shattered by the 0-3 defeat, barely holding it together in the post-match press conference, though his mother stayed close by for emotional support. Yet Caruana remained objective. “Nothing really went well for me today – I didn’t even put up a fight," he said. “I felt a lot of pressure – the match comes with a lot of pressure. The result shows that he is the strongest player in the world and he is the world champion, so it's fitting. I can’t say I missed more chances than Magnus. It was a privilege to play Magnus and a great learning experience." The two players had fought themselves to a standstill in the main part of the match. Their last line of defence was so good that all 12 classical games were drawn, with Carlsen, in the first game, being the only player to miss a straightforward winning move. “I feel that frankly speaking my [classical] game hasn’t been great,” admitted Carlsen, “and, in that sense, the classical portion [breaking even against Caruana] was a step in the right direction. I think I played relatively well and Fabiano is a very strong player. At classical there is nothing to choose between us." 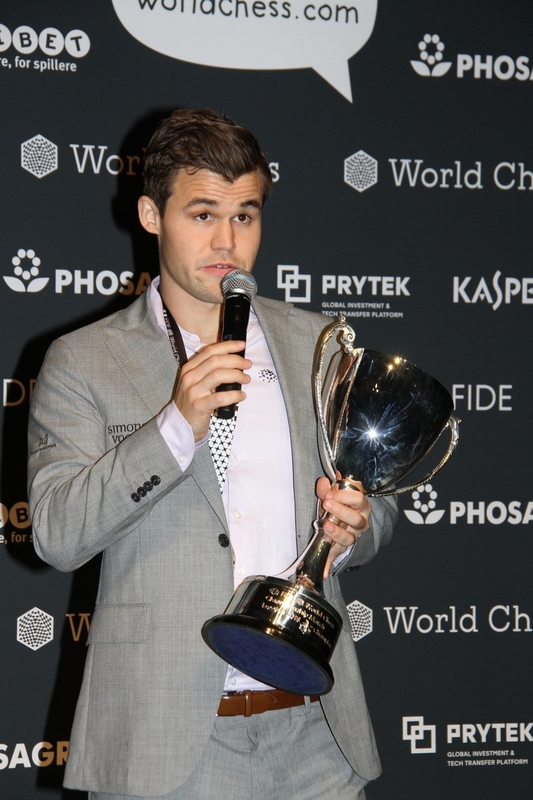 Indeed the format of the Championship was a subject of great discussion, as Carlsen retained the classical world title for the second time thanks to his rapid skills. Most suggested extra games would be more likely to produce extra fighting chess – though one could hardly complain about the efforts made by Carlsen and Caruana – 115 moves in game one and 80 moves in Carlsen’s amazing save in game 6. So Carlsen remains World Champion for the next two years but it is clear that the pack – Caruana, Mamedyarov, Ding – are closing in on him. Whether Carlsen can ever return to the stratospheric levels he reached in his early 20s is a question for debate, so in 2020 it may not be so easy to scramble to 6-6 and then demonstrate his sublime rapid skills. The Carlsen era continues but Carlsen himself was clearly not content with his overall performance in London, given that on the night of his victory he declined all requests for one-on-one interviews, even from the Norwegian media. Perhaps in a day or two he will accept his responsibility as World Champion and agree to explain his thoughts to some media outlets but for now it seems clear that, even on the eve of his victory, uneasy is the head that wears the crown. 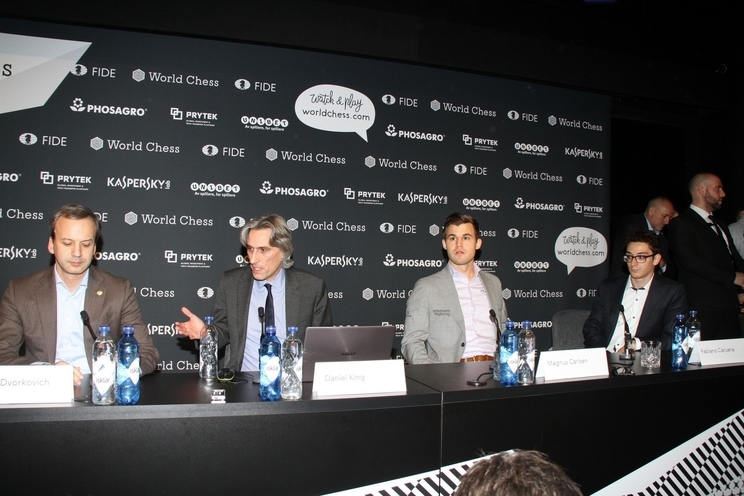 At the final press conference Carlsen was asked if this victory was as special as winning the World Championship for the first time. In order to avoid insulting his hosts, Carlsen answered that this win was of course very special but one could see his mind registering that no matter how many times he retains his title, he will never again enjoy the buzz of that first title in 2013.